A world transform path is a succession of transformations based on an arbitrary path. The objects that are made children of the WorldTransformPath can move along with these transformations. On the Menu bar, click Create -> World -> Transform Path. Choose the path to the .path file. The path can be changed afterwards in the World Transform Path tab -> Path field. Make the object the child of the path. Set the same initial positions of the object and of the path. If the object has coordinates different from the path, it will have the corresponding offset relatively to the path. 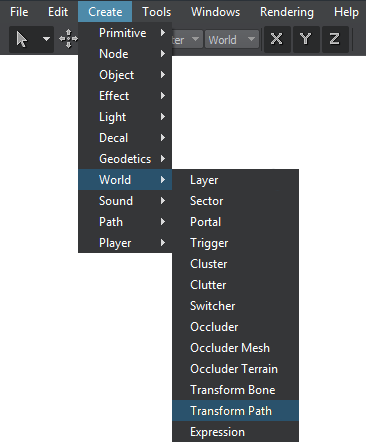 To put the object in motion, click Play in theTransform tab of the WorldTransformPath. Sets a path to the new .path file. Indicates whether the object should be oriented along the path or keep its initial position. Loops the transformation defined by the path. Sets the radius for the WorldTransformPath applying (valid only outside the viewing frustum). If the child object transformed according to the path gets outside the viewing frustum, but stays in the radius range, the playback of the transformation sequence does not stop. If the object is oriented along the path, its transformation will correspond to the path transformation at the specified time. Otherwise, only position of the object will be changed. Negative values provide the reverse playback. Continues playback of the transformation defined by the path, if it is paused, or starts the playback, if it is stopped. Stops the playback of the transformation defined by the path. This function saves the playback position so that playing of the transformation defined by the path can be resumed from the same point.